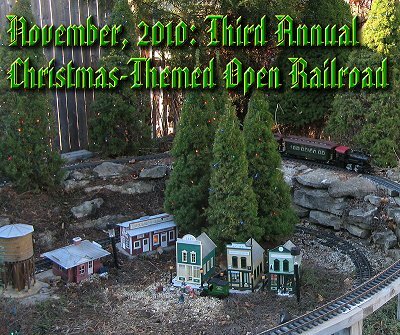 The story of our preparations for 2008's Christmas-Themed open railroad is told in a series of blogs starting in here. The story of 2009's Christmas-Themed open railroad is published here. 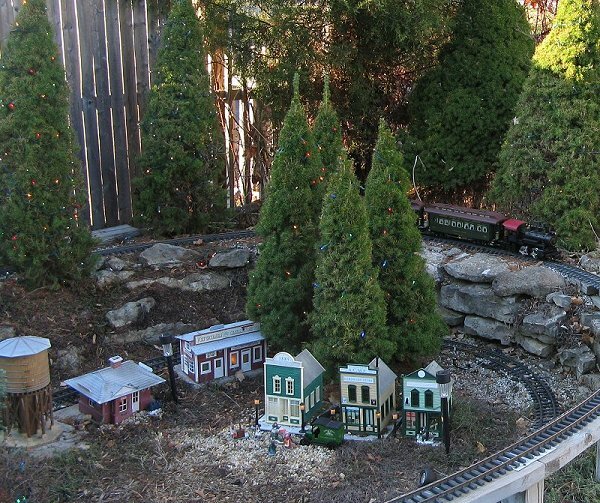 This article is a report on the subsequent planning and execution of this year's Christmas-Themed open railroad, including many of the non-train activities that went into it. We hope you find the lists of ideas and projects helpful if you ever take anything like this on yourself. And we especially hope that the photographs (almost all of which get bigger if you click on them) help you get into the Christmas spirit. Life in 2010 was very complicated for the Races, including a layoff, some miscellaneous consulting, then bidding on two contracts which were supposed to run sequentially, only for them to wind up overlapping by 12 weeks. Plus, we had many 85- to 90-degree days in the summer, which sapped our interest in spending long hours in the garden. Infrastructure improvements in 2010 included doing more work to brace the neighbor's privacy fence, which was still coming down on our railroad after hard storms, planting more "border trees," and replacing bits of the railroad tie retaining walls that had disintegrated. Some of those improvements are described in the April 10, 2010 Blog-Like Article. Later updates, including new conifer plantings, are described in the August 10 article. Except for that infrastructure work, I hadn't cleaned the track or run trains since early spring. So I wondered if it was really worthwhile to consider having another Christmas open house this year. I talked it over with Shelia, then got the dates from the NMRA planners who liked to set up November open houses as follow-ups on the November NMRA train show in Dayton each year. One of the jobs I was working would end about October 16, so that would give me three weeks of working every spare minute to pull it off. Still, I like to have at least one open railroad a year, and this was the only way that was going to happen. 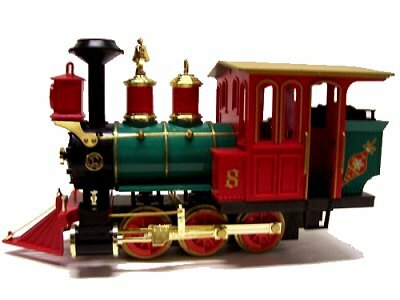 Also, I learned that, once again, the New Boston and Donnels Creek was going to be the only garden railroad open on the tour, and I hate to pass up such a good opportunity to promote the hobby. I told my NMRA contacts Nick Folger and Tom Mroczka to go ahead and publish the New Boston and Donnels Creek in the flyer. I also contacted the members of the club I belong to and promote whenever possible, even though I'm nearly always too slammed to attend meetings: the Miami Valley Garden Railway Society. Since this would be the only open garden railroad on the tour, and it does promote the hobby, I was hoping for some help with preparations and maybe with logistics and "security" on the day of the show. Each year you do this, you learn something new that works and something else that doesn't. Decorating the conifers was a "given," they just look too good covered with lights to let that slide. Having Christmas music playing was also a "given" - it lends a "theme-park" feeling to the occasion. 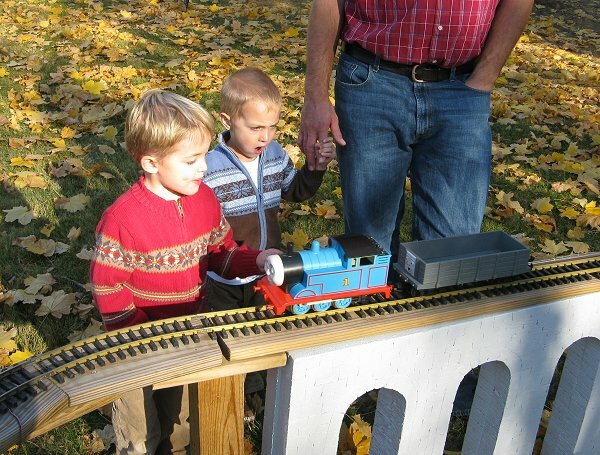 Having two trains that appealed to kids was also a "given," so the Playskool set on the back porch and the Thomas/James temporary railroad were also slated to make return appearances. With more time, I could have had at least one more, but that didn't materialize. Here are some other considerations. Last year, the popcorn popper and home-made cutout cookies were a huge hit. This year I didn't think we'd have time for cutout cookies (Molly made brownies), but I wanted to have popcorn if we could. The fellow I borrowed the popper from last year doesn't work with me any more, so I would have felt awkward borrowing it again. I priced and researched small theater-style popcorn poppers. The one I eventually settled on was NOT the quality of the professional units I have used. But once we figured it out, it made pretty good popcorn. In case you're wondering, we bought a black Paramount 6 oz popper with cart, though I'd recommend the 8 oz popper now. I have posted a review on the Red Version at this link . You'll have to show all reviews to see it, though. The black version, which I bought, is at this link . Though this was technically a six-ouncer, we just made four ounces at a time for most of the day. 1/2 cup of popcorn, 1/4 cup of vegetable oil, and 1 teaspoon of popcorn salt was the recipe. What we figured out eventually was that if you could get the popcorn heated through evenly before it was quite hot enough to pop, it would almost all pop at once and have the fewest "old maids." This usually involved putting the oil in first and letting it heat and stir some before dumping the popcorn in . Once it got very cold, though, the physics of the thing changed, and it got harder to make a good pot no matter what you did. In retrospect, keeping the unpopped corn on the heating tray would probably have helped. The first year I had a Christmas-themed open house, I started out with the biggest, most impressive trains I had to run. Then last year, I had to do so much work on various parts of my roadbed, that I didn't have time to get everything optimum for the really big stuff. So I mostly ran little, Christmas-themed trains, including Bachmann Christmas trolleys and the Aristo Christmas passenger train. Of course, a few of those DIDN'T have internal lighting, so as it got dark, I rotated in other cars that would show up in the dark, including my Aristo PR "Sierra" cars that have internal lighting. I learned that, for a Christmas themed open house where you're doing continuous running, it's more important to have backups and lit cars than to have a few really impressive pieces. Locomotives included the Aristo "critter" (4-wheeled diesel), two 0-4-0 Aristo engines (one black and one red-and-green), an Aristo "eggliner" (shown to the right). As backups, we had a Bachmann Christmas trolley, and old 0-4-0 green Lionel tank engine, and one or two PRR Aristo 0-4-0s in case those gave out. As it turned out the Critter and Aristo 0-4-0s ran fine the whole time, so I didn't really need the backups, but I've learned it pays to have them onhand. As you can tell in the photo below, none of these locomotives is huge, but for a Christmas open house, you're better off having two little locos than one big loco for each train. Just after the open house, I saw one of the old Lionel 0-6-0 Christmas locomotives, and I thought I would add that to my collection, so if you come next year you may see it running. This originally came from a set, but I already have the Lionel Christmas caboose, so I didn't need the whole set. Thanks to Mike Moran of Beacon Hill Trains for this addition to my collection. The permanent railroad consists of a slightly raised 60'x12' loop and a much smaller, ground-level loop (shown at the right below). During daylight hours, I ran a passenger train on the upper loop and a freight train on the lower loop. After dark, I ran passenger trains on both loops so you could see them. I didn't have time to prepare any new buildings for this year's open house. But I was able to get most of the buildings I used lit and on a timer. There is something heartwarming about looking across the yard on a cold winter's night and seeing all the little lamps and windows lit up, even if I'm not running trains. The buildings, some of them twenty years old, will survive another Christmas season, and then some, but I will make a point of getting them indoors after Jan. 1, because they are starting to show signs of wear and tear. If I get a chance, next year's buildings may be made of other materials better suited for wintering over (like maybe concrete). I set up my floodlights and spotlights again, but one circuit inexplicably stopped working halfway through the open house. I need to install these better anyway, so I'll hopefully sort that out next year. If you ever see this Playskool railroad set at a garage sale, flea market, whatever, buy it. 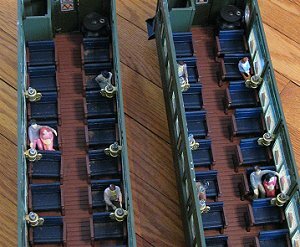 They haven't made it for about twenty years, so they're hard to find, but this is the ideal first train for kids. Large scalers appreciate that the train runs on track that is ALMOST as wide as G gauge (45mm), so it will run on a loop of LGB track, although it won't go through turnouts or anything fancy like that. To turn the train on, you bump a yellow button on the smokestack. To stop the train, you bump the button again, or you turn a lever that turns the train off from underneath. This isn't designed to use outdoors, but for one or two evenings a year, it will survive. And the kids love having a train they can run themselves. 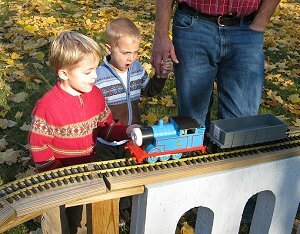 My Thomas/James temporary railroad dates back to a clinic I taught in 2007, after which I gave the big RR we built away and keep this one. It brings the trains up to the kids' eye-level. I don't have it set up for them to run, although I probably could do that next year. For this railroad, I have acquired a Thomas, a James, and a "backup" Thomas. Plus I have two coaches and one "troublesome truck." I had to replace some of the track on this loop, because it had gone out of gauge from repeated setting up and tearing down. Once I did that, the railroad ran smoothly in testing on Saturday. By Sunday, though, temperatures were cooling, and the little engines had trouble pulling more than one car. When the kids had watched Thomas for a while, they were excited to see James come out, and vice versa. 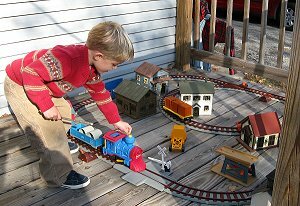 Because the two children's railroads were more or less at opposite ends of the yard, several of the kids wore themselves out running back and forth between them, something their parents didn't seem to mind. Of course the kids liked watching the "big railroad," too. I had been telling folks to try to arrive by 4:30 so they could see the railroad in daylight, and stay until 5:30 when the lights would start really showing up. Quite a few did get to see the railroad lit up. I had replaced more of the incandescent strands with LEDs, so most of the railroad glistened like rubies, emeralds, and sapphires. The one "off note" was our little On30 train, which stopped running and I didn't have time to troubleshoot. After everyone was gone and I was taking stuff in, I realized that someone had picked up the locomotive clumsily and bent the running gear on one side so that it jammed. Had I realized that was the problem, I could have substituted one of my other On30 locos. After I got it unjammed it seemed to work. So next year if I set it out, I'll have better "security" on it, and I'll have a backup locomotive handy. To provide one more activity for folks who came after dark, I painted a used 4'x4' plywood sheet light gray, then set up an old video projector playing The General in front of two rows of wooden folding chairs (metal would have been WAY too cold). I had hoped to set up something more elaborate, but you know how things go. By the time it was dark enough to see the screen, it was really too cold for anyone to sit and watch the whole thing, but several folks did sit for a while to watch, including some kids who had grown tired of watching the trains, but whose parents weren't ready to leave quite yet. So, if I have time next year, I might set up a version that's a little more elaborate. Usually, I try to get more and better photos of the trains running after dark through the lit trees. Unfortunately, we started getting snowfall and cold weather several weeks early this year. I might get some photos with snow on the railroad - that's always charming. But since there was no snow during our open house this year, that would be misleading. Of course having too much snow to see the trains or buildings can be an inconvenience, too, as the following photo, taken on December 15 shows. 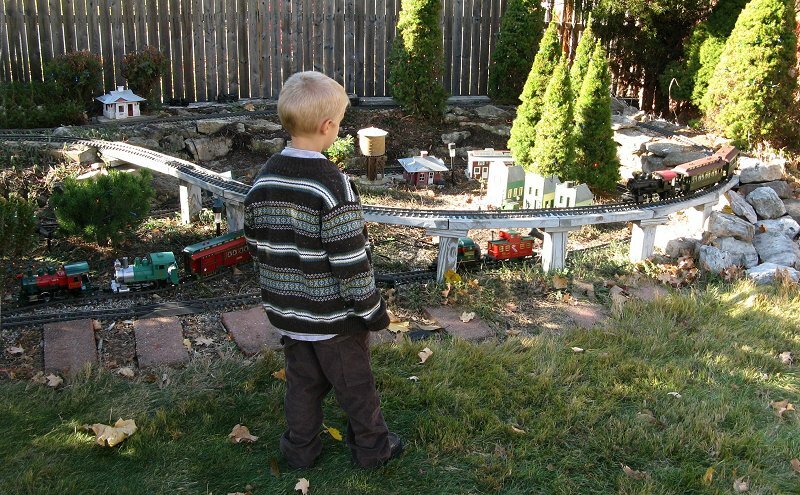 Except for an extra couple of inches, that's pretty much what our railroad looked like from mid-November on this year. Believe it or not, the little lights are actually on underneath that layer of white. Thanks again to my wife Shelia, daughter Molly (who came home from school in Indiana) and sister Tess (who came down from Grosse Ile, Michigan) for all their help with the treats, the popcorn, and (in Molly's case) setting out the figures. Once again we survived a "cold-weather open house," which is not always easy in Ohio. We had over 100 visitors (not all the kids were signed in, so it's impossible to get an exact count,) went through almost ten pounds of popcorn, answered dozens of questions about garden railroading, and made many new friends. Fortunately, when it turned cold, it didn't turn THAT cold. I wouldn't mind having something to help folks stay warm outside on the nights it does, but I would need to have someone to supervise the kids, too, and we were stretched pretty thin. One thing is for sure - the visitors who found their way out here because of the train show REALLY appreciate having at least one open Garden Railroad they can come out to see. A few families are beginning to make it a Christmas tradition. A few days later, our neighbor had family in town, so we plugged things in again for an impromptu "semi-private" showing, without the kids' trains. I left the Aristo passenger train out, which turned out to be a bad idea, since we had a sleet storm that night and it was a couple of days before I could dig them out. By the time I did, the wheels on the 0-4-0 and the Sierra coaches were pitted with blue spots - something I've never seen this bad in over a decade of this, even when I've left trains out for weeks. Of course the loco wheels are easy to clean, but the Sierra coaches' wheels will be a tad more work. Seems like a little storage shed adjacent to the railroad for those days when you don't have time to schlepp everything back in would be an especially good idea for cold-weather running. If you think you might be coming through southwest Ohio and you want to stop by, or if you want to be put on our mailing list for future open houses, please contact us and let us know. Note: Family Garden Trains?, Garden Train Store?, Big Christmas Trains?, BIG Indoor Trains?, and BIG Train Store? are trademarks of Breakthrough Communications (www.btcomm.com). All information, data, text, and illustrations on this web site are Copyright (c) 1999, 2000, 2001, 2002, 2003, 2004, 2005, 2006, 2007, 2008, 2009, 2010, 2011, 2012 by Paul D. Race. Reuse or republication without prior written permission is specifically forbidden.